Kizomba dance, an African partner dance, has found a home in Fort Lauderdale at the only African restaurant in both Broward county and Fort Lauderdale — Meli Melo Native African Cuisine, 7547 West Oakland Park Blvd. Kizomba originated in Angola, Southern Africa in the late 1970s and was influenced by the hip circles and shadowing movements of the native Semba dance. Semba had been danced in the 1950s in Angola. Kizomba means "party" in Kimbundu an Angolan language. Kizomba music and dance rose in popularity in the 1990s and are characterized by a slower, deliberate, more sensual rhythm peculiar to French Antillean compas and zouk. In fact, it was after hearing music from the French Antilles, Angolan musicians attempted to mimic the sounds while adding a very heavy and highly recognizable drumbeat – similar to that of reggae. Angola was a Portuguese colony until 1951, so most kizomba songs are written and performed in Portuguese. Newer kizomba musicians sing partially in English to appeal to an international audience. Additionally, popular American and European songs have been remixed by kizomba deejays to reflect a kizomba pattern and sound. These remixed songs have caused the music and dance to be accessed by audiences in places like North America. In the 1990s, when kizomba music grew in popularity, Angolan semba dancers started to adapt their semba steps to kizomba tempo. Then, it took off across Europe and then around the world. The proprietor of Meli Melo Native African Cuisine, Grace Xavier, is from Nigeria. However, her cuisine is pan-African and features peri peri wings, both a Southern African and Portuguese spicy chicken dish. "We are so glad to have activities in our space that reflect the beauty of the African continent," she said. 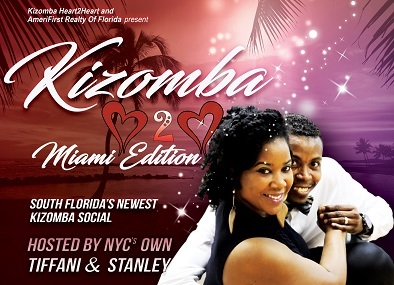 Kizomba dance classes are brought to you by Kizomba Heart2Heart, a new dance community that was transplanted from NYC to South Florida in 2016. They host a class and a dance party every Wednesday from 8-11 p.m..